What do we need to learn about complex systems? There was a time when organisations could define exactly what it was that they expected from their systems. The job of the designers was then to couple systems’ behaviors that they created and/or inherited in such a way as to over-determine the behaviour of the resultant complex systems and thus satisfy the organisation’s requirements. In judging the actual performance of these complex systems, this same presumption of over-determination allowed the behavior of these complex systems to be modeled independently of their contexts-of-use, enabling the risks to be identified of something accidental happening. In the 2 x 2 below, we are in the right-hand column. But now we want our systems to be agile and responsive, capable of supporting demands on them not previously anticipated. Service-oriented architectures (SoAs) introduce under-determination into the ways systems can be coupled together, while agile software development processes bring the spirit of mash-ups and bricolage to the just-in-time assemblage of workable solutions. Reducing the way a system over-determines its uses in order to enable its users to extract greater economies of scope from it is one of the primary aims of SoAs, but has the effect of reducing the North-South dominance of the way the system may be used. In the place of a centrally defined requirement, the user now find himself or herself at an ‘edge’, where the organisation meets a new kind of demand on it. Judging performance under these conditions of under-determination now requires him or her to include the governance mechanisms that are determining those particular responses at the edge. Are they appropriately under- or over-determining? So how are we to model and simulate such governance mechanisms alongside the behaviour of the systems themselves? The answer is that we have to be able to include the context-of-use itself, which is constituted both by the organisation’s construction of its own role as supplier, and also by the client/customer’s construction of demand. What do we need to learn about? 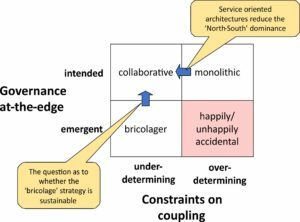 We need to learn about how to model the structure-determining processes of the organisation-in-context as well as the structure-determined processes of the systems the organisation uses. We need to learn about modelling the left-hand column. to over-determine) is to impose equifinality aka the game is rigged always to produce the same outcome… for example, the corporation wanting to guarantee outcomes that serve its interests. to be under-determined means that the subject-user experiences choices in the way s/he can use the system. This is what Humberto Maturana meant when he said that there is no such thing as power, but only obedience to at least implicit power/knowledge (he was speaking about being threatened with a gun by the police in Chile). Such choices may emerge, however, through encountering an undecidability. At this point, the question arises: is there a flaw in the design of the system, in the subject-user’s model of how to use the system, or both. Whichever it is, under-determination places the onus on the subject-user to decide, potentially facing his or her with a 2nd crisis in the three moments, when s/he comes to realise that s/he is never going to be able to work it out, but instead must act. ‘Wicked’ problems fall into this category of being undecidable (see the wickedness of socio-technical ecosystems). Challenges to meet new kinds of demand are thus also always potentially disruptive of existing governance relationships.